Totally Hyped for Ni No Kuni II!! After Playstation Experience, many gamers were left with even higher anticipation for Uncharted 4, and utter confusion as to whether the remake of Final Fantasy VII is actually a remake at all. But for me, there was one thing that stood out above everything else presented at the event, and that’s Ni no Kuni II: Revenant Kingdom. When Ni no Kuni: Wrath of the White Witch was released in the US in January 2013, it became one of my favorite RPGs of all time, and despite its release so early in the year, it remained my favorite game of 2013, and my favorite PS3 exclusive. Though the game sold decently well and got its fair share of acclaim, it didn’t necessarily fly off shelves. And while it won a number of awards in the RPG genre, it failed to gain very many mentions for Game of the Year in 2013 (perhaps because it wasn’t purposefully created to be a Game of the Year like GTAV, Bioshock Infinite and The Last of Us were). 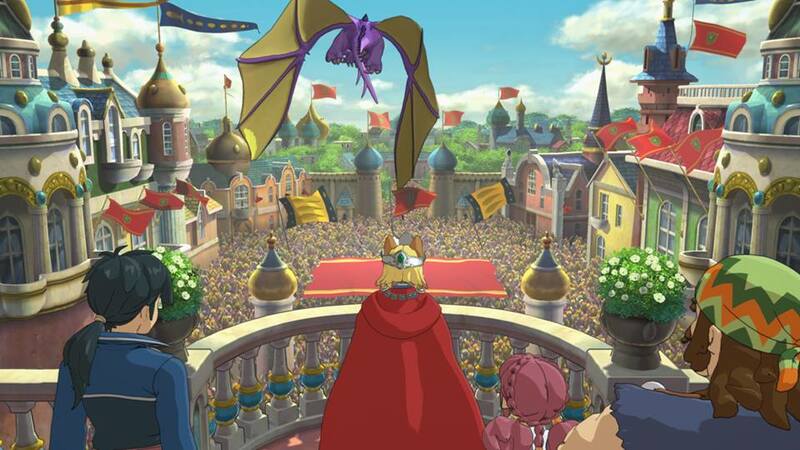 So what made Ni no Kuni so special? For one, it was a good old-fashioned JRPG made new. It didn’t reinvent the genre, but it combined elements from series like Pokemon and Dragon Quest in a way that made it feel fresh and innovative. It had the best cel-shading since The Winder, giving the graphics a gorgeous, timeless appeal. The character designs and cut scenes were created by Studio Ghibli, and composer Joe Hisaishi – famous for his scores for Ghibli films – provided the game’s phenomenal soundtrack. And, of course, it told one of the sweetest stories I’ve ever seen in a video game, complete with one of gaming’s greatest cast of characters. Ni no Kuni was a terrific game, and holds a special place in my heart for both personal reasons and for the game itself. And the announced sequel looks to keep the heart of the original, which can only be a great thing. 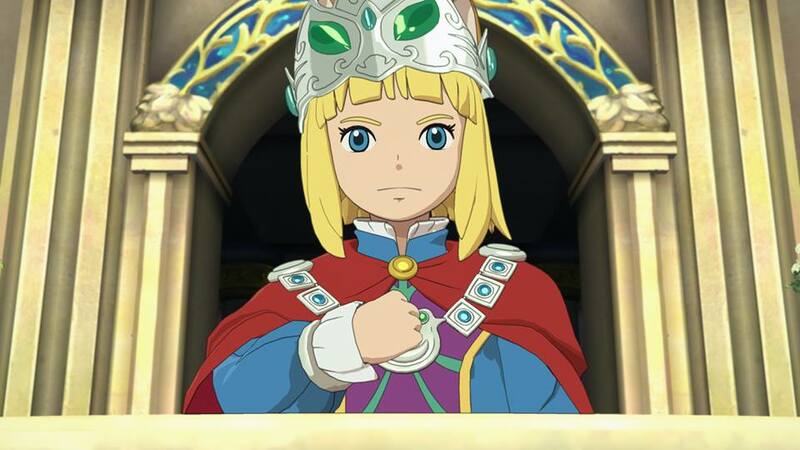 I’m not sure what other people’s reaction are to the fact that Ni no Kuni II features the same game world but a new cast of characters. Personally, I don’t think it would make much sense to have the same characters from the first game, since that felt like a complete story (more accurately, two complete stories). I suspect some of the secondary and tertiary characters will show up again, which is perfectly fine, but I’m excited to see where the game goes with the new characters. The released trailer already gives a brief introduction to some of the characters and plot elements (though only vaguely), and shows how beautiful the series’ visuals look on PS4. Once again Ghibli animators and Joe Hisaishi return for the character designs and music, respectively. And it all looks wonderful. Of course, the trailer didn’t show a whole lot in terms of gameplay, but there’s still plenty of time for that. Considering it’s only the second game in the series (not counting mobile spinoffs), and that the first one came out almost three years ago already (in the US, in Japan its been almost five), it’s not exactly like the series has seen overexposure. I’m hoping the gameplay remains similar to the first title, with maybe some meaningful additions here and there. There’s no need for a total overhaul at this point. Sadly, the game has no release date as of yet (otherwise I may have to revise my list of most anticipated 2016 games), but no doubt it has joined the likes of Yooka-Laylee and Zelda Wii U as one of my most hyped games on the horizon. If Ni no Kuni II is anywhere near as beautiful of a game as its predecessor, it will be a real work of art. Excellent read! I know Ni No Kuni holds a special place in your heart, so I’m pleased to hear your excitement 🙂 hopefully it’s able to rival the charm, beauty, and challenging nature of the beloved original! Do you know if Studio Ghibli is back for some more gorgeous animation? I’m not sure if there will be hand-drawn cutscenes, but since the character designs are by the same Ghibli animator, I think it’s a safe bet that Ghibli’s role with the game will largely be the same. I don’t have a PS4 yet, but I plan on getting one really soon. I know I have some catching up to do, and have a lot to look forward to. Shame I can’t afford an Xbox One as well, since Rare Replay is basically a dream come true (in particular, I love the Banjo-Kazooie games, and Conker’s Bad Fur Day is the one Rare classic I’ve never played, and it’s so expensive to buy the N64 original). Fingers crossed that Studio Ghibli is involved in some shape or form. Oh geez, to be honest, you would absolutely obliterate in Smash. I’m particularly awful, but it still manages to be so much fun. Studio Ghibli makes everything better, that’s for sure. Man, have you played Banjo-Kazooie and Banjo-Tooie yet? Not even kidding, those might very well be my favorite N64 games. I love them. Glad to hear another person enjoys Conker’s Bad Fur Day. I’m really, really dying to play it. I may just have to fork over 90 bucks for a used copy. Is the version in Rare Replay the N64 original or the Xbox remake? By the way, have you played Tropical Freeze yet? I’m almost at 100 video game reviews on this site, and after that I think I’m going to give DKCTF another go. I’ve just been thinking about playing a lot again lately. The more I think about it, the more I think it’s one of my all-time favorites. I may even end up putting it in my top 10! You definitely need to check it out if you love platformers. Studio Ghibli is my favorite animation studio, and nearly everything they touch is pure magic (Tales From Earthsea is the exception). Definitely give the Banjo-Kazooie games a go when you get the chance. I flip-flop between which one I like better, but they definitely should be played in order. I’m glad you think so highly of my opinions. 🙂 Always good to know my stuff is appreciated. Geez, $80 plus tax? That’s insane! Here in the states it’s $60 for a new game, which is still a lot to fork over. And yes, Conker goes for $90 just for a used, unboxed copy. If I wanted one still in the box with the booklets and everything, I’d have to pay $500 for it! I definitely plan on getting Conker though. I wish I could just get Rare Replay but I think it’s going to be a while before I get an Xbox One. I’ve heard nothing but good things about Conker through the years, and can’t wait to finally play it myself. If money is the issue though, the old DKC games can be purchased on the Wii U Virtual Console for a low price (it’s $8 in the US for each). Tropical Freeze, being a Nintendo game, still goes at over $50 dollars despite being almost two years old (Nintendo games don’t ever seem to lower the cost). That’s all up to you really. Like I said, you can download the classics on the Wii U Virtual Console without burning too much of a hole in your pocket. But you definitely need to get around to them and Tropical Freeze whenever possible. On an unrelated note, I MAY be doing my favorite games list sometime around late March (no promises). Does that timeframe work for you to do a list as well? That’s one of the game that makes me wish I had a PS4.